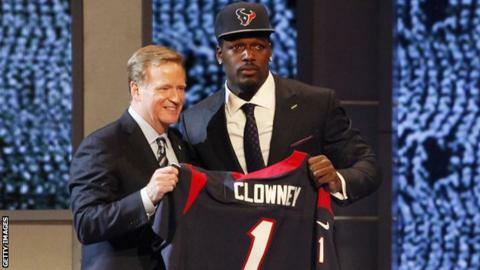 The Houston Texans picked giant defensive lineman Jadeveon Clowney with the first pick of the annual NFL draft. The South Carolina star was favoured over Auburn offensive tackle Greg Robinson, picked by the St Louis Rams. Central Florida quarterback Blake Bortles was drafted third, while his Texas A&M opposite number Johnny Manziel, winner of the Heisman Trophy awarded annually to the top player in US college football, was only 22nd. The draft finishes on Saturday. As a key way of trying to ensure a highly competitive league, teams select the cream of the college crop based upon the reverse order in which they finished the previous season. Houston, who had the worst record in 2013, therefore had the honour of the choosing first, while Super Bowl winners the Seattle Seahawks had the last of the 32 picks. Clowney, who is 6ft 6in and weighs 266lbs (19st, 121kg), is expected to line up as an outside linebacker for the Texans and could form a formidable partnership with one of the NFL's most feared pass rushers, JJ Watt. Manziel, nicknamed "Johnny Football", polarises opinion for his exciting but unconventional style. He was widely predicted to be the first quarterback picked at the ceremony, held at the Radio City Music Hall in New York, but the Jacksonville Jaguars instead went for Bortles. Following a series of draft-pick trades, Manziel eventually ended up at the Cleveland Browns. The second and third rounds of the draft take place on Friday, while rounds four to seven are on Saturday. Among the players nervously waiting by the phone will be Michael Sam, the University of Missouri defensive end who has publicly revealed his homosexuality. If he is selected by a team, he will become the NFL's first openly gay player. No British players are expected to be picked in the 2014 draft, unlike last year when Manchester's Menelik Watson signed for the Oakland Raiders. Is the NFL ready for openly gay star? Read more on Michael Sam: Is the NFL ready for an openly gay player? Read more on Michael Sam: Will being gay affect the NFL prospect's career?